Can you trust what you are reading online? Corin Faife of BREAKER Magazine has published a story showing a lapse in journalistic ethics amongst prominent crypto news outlets. What did he find? 12 of the 28 outlets responded that they would publish the content without identifying it as sponsored. You can see the prices that the companies charged here. This news shouldn’t come as a surprise. In a world of hacks, exit scams (more on this later), and fake ICOs, you should be skeptical of everything you read in crypto. You HAVE to do your own due diligence. Find a news outlet you can trust. Our mission at CoinSnacks is and has always been to break through the noise to find you, the reader, the news you need to know as a retail investor or crypto fanatic. We are an independent group who reads hundreds of articles every week to bring you what we believe is must-know information. Of course, as you are sure to notice, CoinSnacks does accept sponsors. Our sponsors keep our lights on, buy our coffee, and allow us to remain independent. We wouldn’t be able to produce this newsletter without them. But rest assured, any sponsor will clearly be marked as such. 🏁 How far have the 10 largest ICO-funded projects progressed in their plans? 💸 Where is the ICO money now? Why Should I Continue To Be Optimistic About Crypto? In wake of Bitcoin’s 10-year anniversary, instead of looking back (what everyone else is doing today), we’re going to look a few steps forward. The progress we’ve seen over the last 10 years has been nothing short of remarkable… but in today’s bear market, there hasn’t been many price-forward catalysts to hang our hats on. But as Michael Spencer explains in this essay, November may give us a run for our money. Literally. Although we aren’t giving investment advice, it’s clear there are several positive indicators for crypto assets just around the corner that could alter the entire market in the next two months. At the American Cannabis Summit the first-ever nationwide event for cannabis investors – former Speaker of the House, John Boehner, revealed why he’s going ALL-IN on marijuana… and exactly how ordinary Americans can make a fortune from this hundred-billion-dollar industry. Dare we call this cute? Dan Held has written a series of articles in which he likens Bitcoin to a living organism… something that is able to evolve in order to survive. Canadian Crypto Exchange MapleChange: Hacked or an Exit Scam? The Canadian crypto exchange, Maple Change, was reportedly “hacked” last week… resulting in nearly $6 million of losses. They were allegedly hacked… said funds can’t be recovered… and then deleted their website, Discord channel, and other social media outlets. Generally, these events happen in the ICO market. A new ICO will come flying out of the gates, raise money, and then quickly disappear without ever launching a product. Nevertheless, these exit scams and false hacks are nothing new. Keep in mind: If you don’t hold your private keys, you don’t really own your tokens. What Will it Take for Crypto to Boom Again? AI failed to achieve any of its goals for fifty years and then suddenly it was powering everything from driving directions, to search engines, all while understanding your voice, and driving cars around busy city streets. 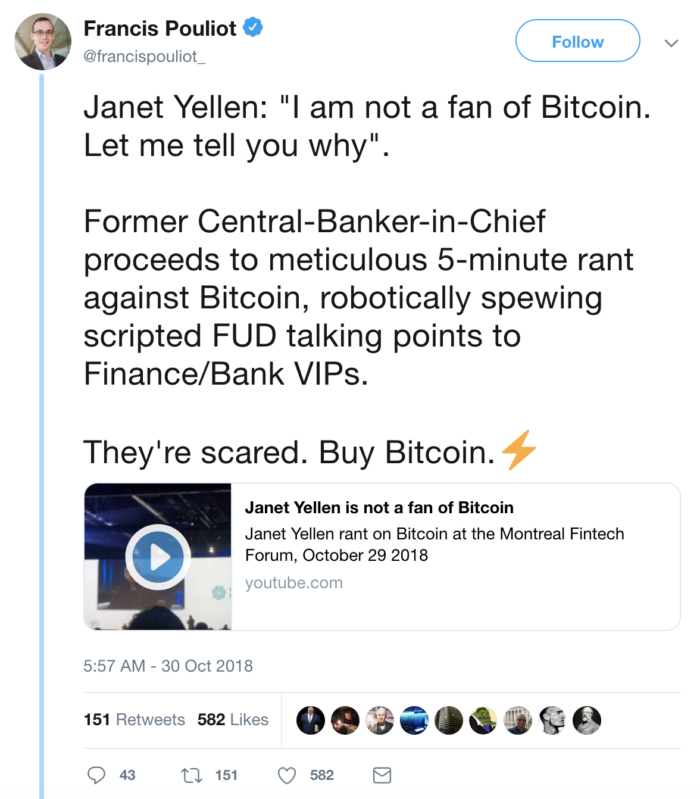 Just like AI, crypto will reach a tipping point where the hype recedes and it starts to do real things that matter. How? Daniel Jeffries argues that Bitcoin will evolve the quickest by looking to the past, not the future. In an era of Russian hackers, super PACs and shell corporations being used by foreign entities to influence voting, officials tasked with maintaining the integrity of state and local elections have one more thing to worry about: crypto-candidates. Developing economies are increasingly playing a larger role in the Bitcoin ecosystem. 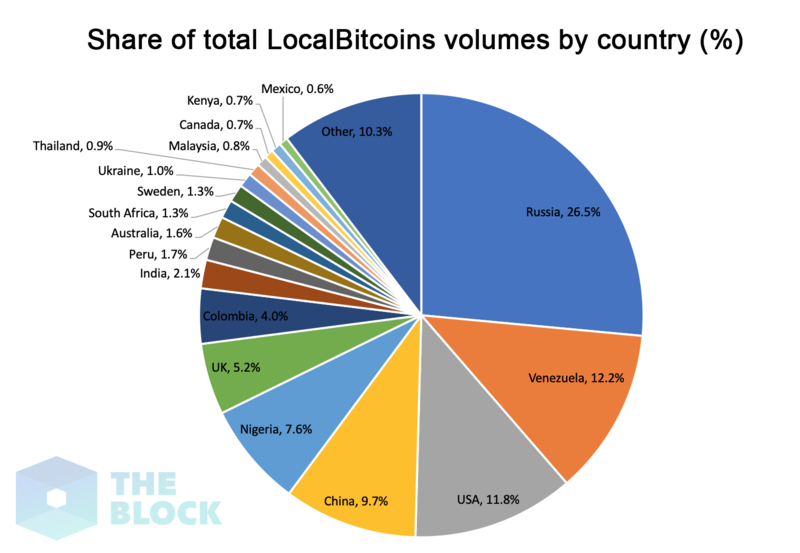 Using LocalBitcoins as a proxy for country specific Bitcoin trading, The Block found that in July 2013, about 90% of all Bitcoin volume was coming from the U.S., the UK, and Australia. Fast forward 5 years, these three countries now share a mere 19% of all volumes. So why are Russia and Venezuela leading the pack? Russia is expected to approve new legislation regarding the legality of local cryptocurrency exchanges by the end of 2018. Until then, there are no regulated cryptocurrency on-ramps, which explains the high LocalBitcoins volumes.